Mobile disco lighting hire for weddings, events & parties in Berkshire. 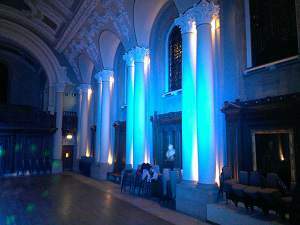 Wedding Up lighting hire is a good way to enhance the venue especially if it has nice structural features. 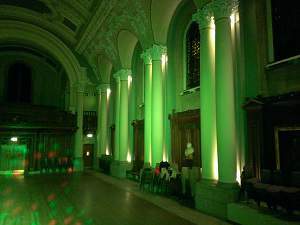 We can provide mood lighting to any party venue creating the perfect party atmosphere with LED lights. Any venue, large or small will be transformed by elegant LED up lighting when you illuminate an entire wall, ceiling or floor with colour. LED up lighters are an ideal form of Mood lighting creating the perfect atmosphere for your event, wedding, or party. LED Up lighting is subtle way to light up a room or wall where you want a wash of colour. With most venues prohibiting the use of smoke machines, LED effects are a perfect solution for discos as they work just as well without the need for smoke or haze. Marquees are the ideal setting for our LED uplighters, where you can replace standard white halogen lighting, with rich vibrant colours. 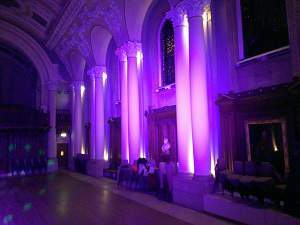 Consider LED Up Lighting for your event, wedding, special occasion or party and give it the wow factor. Mood Lighting is an ideal complement to other forms of lighting such as fairy lights or lanterns. If you prefer, later in the evening the lights can be sound activated creating a wash of all the colours activated by the music creating a focal point. When combined with the mobile disco lighting the effects look amazing. These create clouds of smoke and quickly throw out smoke filling a room in seconds. The smoke is noticeable and is more likely to set off smoke alarms (if fitted and active in venue). Smoke dissipates quickly and will visually transform the mobile disco. The particles that a haze machine produces are smaller than that of a smoke machine. This is why haze is less visible in the air and is less visible to smoke detectors. However there are no guarantees that a haze machine is safe to use with fire alarms. You should always discuss this with the venue. Fairy lights & Drapes can be supplied subject to availability. These can be hung from ceilings or used to create a feature wall at your wedding venue. We can provide lighting in Ascot, Bracknell, Henley-on-Thames, Maidenhead, Newbury, Reading, Goring, Windsor and Wokingham.